As many of you already know, in 2001, the Penobscot property was purchased with the expressed purpose of creating a sanctuary for animals like no other in New England. We set out to follow certain ethical, care and management protocols that would ensure our integrity while providing our residents with lives reflective of the love and care that we wish all animals could enjoy. The property in Penobscot was a “stepping stone property” however; it wasn’t meant to be the place that carried our shelter far into the future. Rather, it was a place that would allow us to get started, help as many animals as we possibly could, while building a solid reputation in the animal rescue community- done on a tight, working budget, where spending was prioritized for animals. We had many goals which we’ve realized here- we have helped thousands of animals in the past 15 years. We’ve helped other organizations help animals, and we’ve given people an opportunity to step into our shoes- to experience what we’ve always known about animals- that they deserve a whole lot more than we allow them in our society. 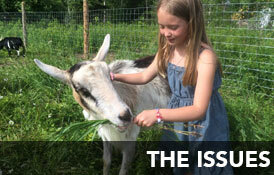 We’ve known for quite a few years that in order to create the long-term vision that we originally set out to create for the animals of Peace Ridge, and to be able to offer more intervention and assistance in animal neglect, abuse and hardship cases, that we needed to have more space and even better habitats for the animals, more efficient facilities, and more staffing. We’ve wanted to invest in creating a legacy for animals- a home like no other which legally belongs to them forever, a place that works for animals in need and is secure forever. This vision necessitates that we move. We have finally realized that dream- WE WILL BE MOVING!. Peace Ridge Sanctuary has secured the largest land holding for sanctuary animals on the eastern seaboard. We are purchasing an 800 +/- acre estate-farm in mid-coast Maine, just 40 minutes from our Penobscot property, where, with your help hopefully, we will be setting up a comprehensive facility designed to rescue, rehabilitate and care for the animals who need us. We will still be specializing in farmed animals, dogs and small animals- our mission has not changed. In addition, we will be creating a major equine rescue facility, as well as developing a wildlife rehabilitation and release program over time. Securing this property has been a major undertaking, and this is why we’ve been more quiet than usual in 2015. We’ve focused our attention on the animal rescue that happens on a weekly basis here, trying to attract support for the operations budget- which is never easy, while working on a “silent capital campaign” to raise the purchase costs for this amazing, one of a kind, paradise for animals. In the end, a handful of special donors made this happen- we are eternally grateful to them! So, for now – please catch your breath with us and stay tuned! We will be launching the second phase of our capital campaign soon- identifying infrastructure needs for the new facility. In addition, we will outline the many ways you can help us raise the funds we need to make the move and future development happen.